First rehearsal I attended for a few weeks; it was wonderful to be back. Bergen Opera Choir, of which I became a member this autumn, and Anne Randine Øverby, the musical director, really know what they're doing. 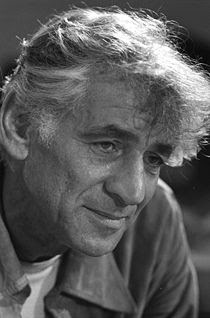 Right know we're practising on the piece called "Mass", composed in 1971 by Leonard Bernstein (the picture was taken that year). It's an opera of sorts, based on the catholic Ordinary of the Mass, mixed with a Broadway musical approach, and a big element of popular music as well. I've been a choral singer since I was eight, but "Mass" is what I've had the most fun singing with a choir. Everyone should listen to it (it's on Spotify, but make sure you get the version recorded by Bernstein himself), and/or come to the opera in April. It's going to be magnificent! We're doing it in a church (St. John's), so I'm also rather curious to see how the director will transform the interior to a theatre.